In the past few years, new technological innovations in the A/V field have elevated the audio receiver from simply acting as an amplifier for one audio source by connecting to a pair of speakers. Now, you can purchase high-level audio receivers that allow you to use one receiver to manage a variety of different inputs and route signals to multiple different devices. In fact, some devices are so sophisticated that they allow you to set up different ‘zones’ in your house and program different signals to be delivered to each different zone. With a Multi-Zone Receiver (AVR) like the Marantz SR6010, you can control multiple speakers in your home using just one device. If you’re looking to streamline your home A/V setup by running multiple rooms of speakers in your house with only 1 receiver, I suggest looking into purchasing a Multi-Zone Receiver, commonly abbreviated as an AVR. AVRs are a great base to start with when building out a home theater system, because with only 1 AVR, you’ll be able to power your home theater and run your whole house audio at the same time! Two brands I really like for their AVRs are Marantz and Pioneer Elite. 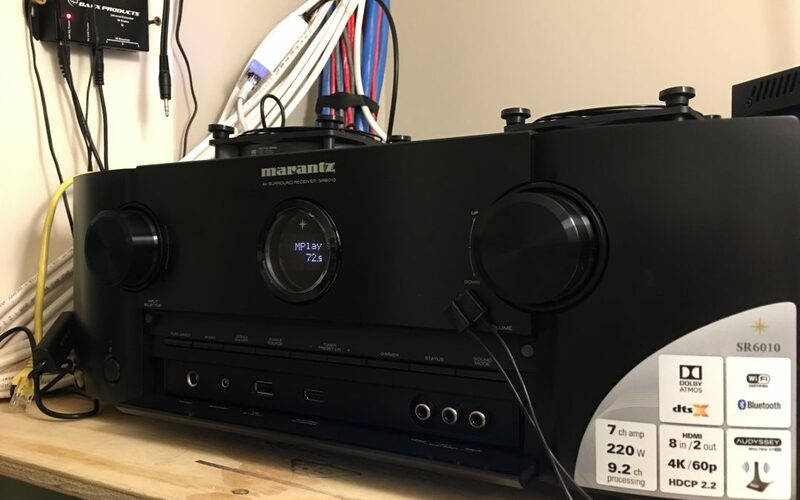 Marantz has accrued a following of audiophiles who love the natural sound of their receivers, and I am partial to Marantz myself, but Pioneer Elite will give you more wattage per dollar, but that does not equate to more sound. It’s also worth noting that both companies offer AVRs with Dolby Atmos and DTS:X surround sound capabilities this year, so make sure to get one of those models if you are interested in setting up your home theater to have the best quality surround sound possible. Essentially, these Multi-Zone AVRs will allow you to run your home theater’s speakers, plus another room in your house’s speakers plus video, with just 1 AVR, eliminating the need to have a different system in every room. With proper wiring, these devices make it possible to store all of your equipment in one closet, making it so that there are no visible wires or amplifiers in your rooms, just your televisions! If you’re going to push your reciever to it’s limits, make sure to keep it cool. Check out my post about a great cooling fan setup from AC Infinity.